Prepared with cane vinegar and aged in oak barrels, Pickapeppa Sauce has a sweet but mellow flavor that gives it an unmatched versatility. It has, in fact, been called “Jamaican Ketchup” in tribute to its range of uses. 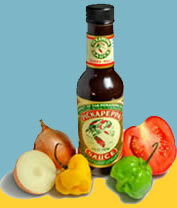 Pickapeppa is undoubtedly a unique and delicious Jamaican sauce. From cream cheese to crab dip to barbeque to baked bananas, Pickapeppa Sauce is the perfect choice to add smooth, sweet flavor to any dish. I have been looking everywhere for this unique Jamaican sauce, Malik stores came up with the goods!